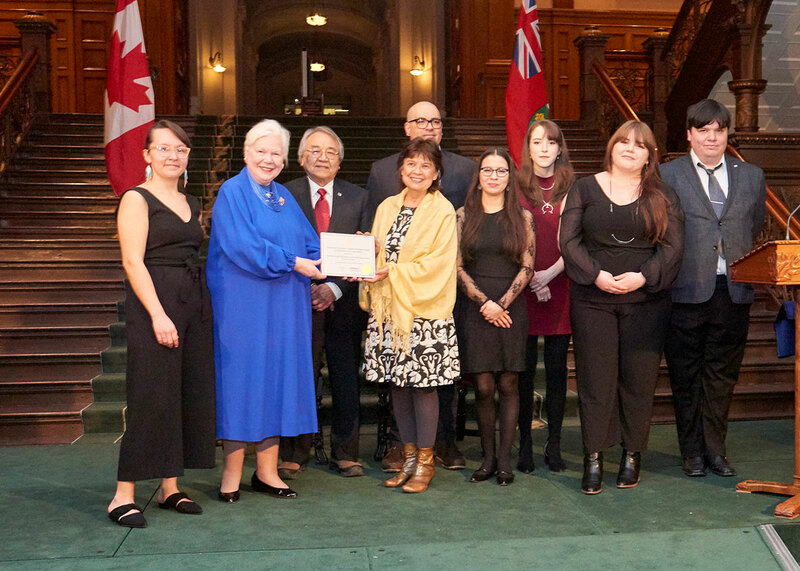 Eight undergraduate students from OCAD University’s Indigenous Visual Culture Program (INVC) received Lieutenant Governor’s Ontario Heritage Awards for their project Uncover/Recover. A joint web-based project with the Royal Ontario Museum (ROM), the students, led by Professor Bonnie Devine, worked with curators and others to create an educational, interactive, accessible and informative multimedia exhibition to celebrate Indigenous peoples’ creative legacy – past, present and future. Award recipients (Michael Crawford, Ana Morningstar Cisneros, Megan Feheley, Shawn Johnston, Mariah Meawasige and Karalyn Reuben) with Lieutenant Governor Elizabeth Dowdeswell, Harvey McCue, Chair, Ontario Heritage Trust, and Professor Bonnie Devine. 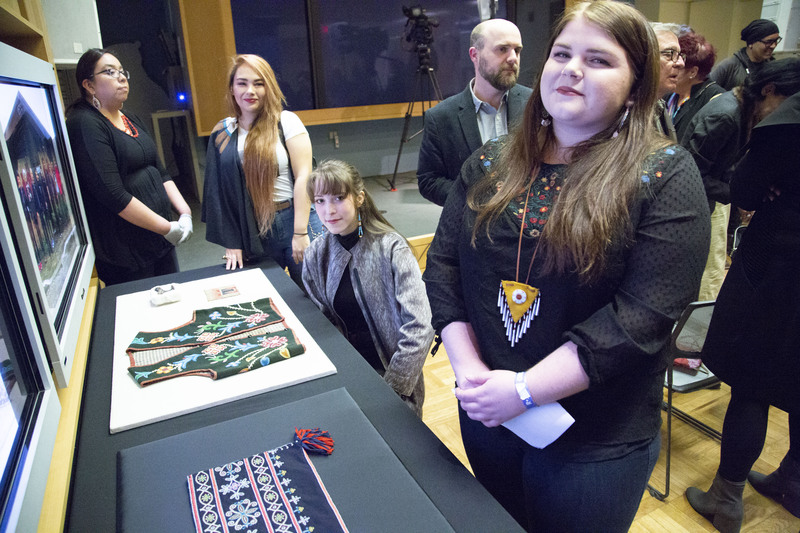 Students learned new digital and creative processes, engaged with senior Indigenous scholars, knowledge keepers and museum workers, and analyzed their chosen objects. 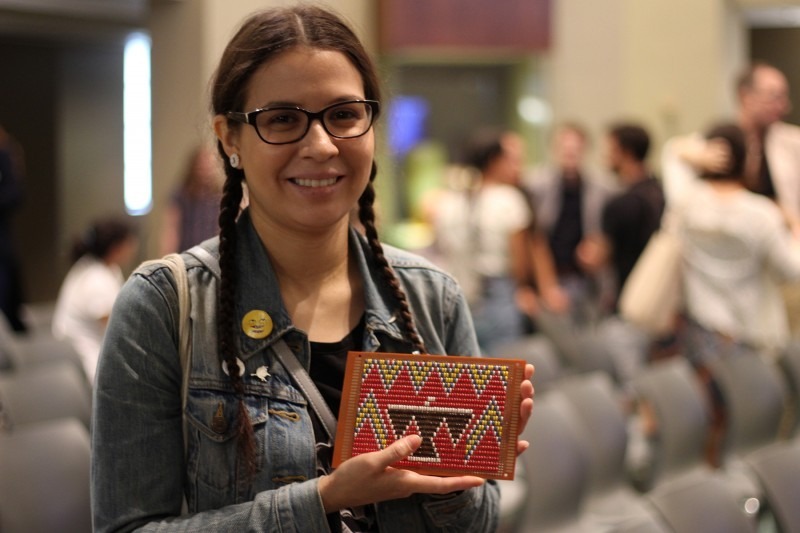 Their work uncovered and recovered the objects’ original purposes and re-engaged them in the work of Indigenous social reconstruction and restoration. The resulting artistic responses range from humorous to poignant, analytical to emotional, and provide a unique picture of contemporary Indigenous thought and creation. The awards were presented at a ceremony led by the Lieutenant Governor of Ontario on Friday, February 22. Established in 2007, the Lieutenant Governor’s Ontario Heritage Awards are annual juried awards administered by the Ontario Heritage Trust to recognize exceptional achievements in heritage conservation. Presented each year in a ceremony at Queen’s Park, the awards are part of the Trust’s annual celebrations marking Heritage Week. Interested in connecting with Artist-in-Residence Vanessa Dion Fletcher? Faculty, students, grads and members of the public are invited to connect with Vanessa during her time here at OCAD University. Drop in and see what’s happening. Response Exchange is an opportunity for you and Vanessa to exchange ideas and comments about your creative practices. Come prepared to share artwork, idea or writing that you would like a response to. In turn, Vanessa will ask for your thoughts on Art she is developing during her residency. To book an appointment for Response Exchange, email Vanessa. Invite Vanessa to join your class. To schedule a class visit, email Vanessa. Vanessa Dion Fletcher employs porcupine quills, Wampum belts, and menstrual blood to reveal the complexities of what defines a body physically and culturally. She links these ideas to personal experiences with language, fluency, and understanding. All of these themes are brought together in the context of her Potawatomi and Lenape ancestry, and her learning disability caused by a lack of short-term memory. Her work is held in the Indigenous Art Center Collection in Gatineau, Quebec, and Seneca College. In 2016, Dion Fletcher graduated from The School of The Art Institute of Chicago with an M.F.A in performance. She is the recipient of the 2017 Textile Museum of Canada Melissa Levin Emerging Artist Award. OCAD University is proud to announce an inaugural residency with artist Vanessa Dion Fletcher at the Rosalie Sharp Pavilion. Vanessa will complete an in-situ six-month Visiting Artist residency, which will be followed by a six-month post-residency to disseminate the results with their guidance and support. Funded by the City of Toronto’s Indigenous Arts and Culture Partnership Fund, the residency will be hosted by OCAD University’s Centre for Emerging Artists and Designer and the Indigenous Visual Culture program. OCAD University’s Rosalie Sharp Pavilion is the home of the Experiential Learning Centre. The building’s refurbishment is a milestone in the Creative City Campus project, boldly re-imagining the use of space to expand studio, digital and work-integrated-learning learning. Located on level 3, the Centre for Emerging Artists and Designers (CEAD) is OCADU’s Career Development office and Experiential Learning Program. The CEAD supports the early-career advancement of all OCAD U students and recent alumni. Access Info: 115 McCaul St is located at the corner of Dundas St and McCaul St on the southeast side. The entrance to the building is on McCaul St and has an electronic door with a punch button. The building is undergoing construction and there is scaffolding over the entrance. Level 3 can be accessed via an elevator or stairs. The floor is an open concept space and direction to the studio or other questions can be asked at the reception desk. There are gendered wheelchair accessible washrooms. We encourage students and faculty to set up a time with Vanessa for mentorship, critique and conversation. Please email Vanessa directly to set up a time. Indigenous vs. western capitalist models separate communal relationships; artists vs. students vs. teachers/scholars and create economic barriers and social hierarchies. This model is antithetical to Indigenous placemaking, economic, and creative expression. My residency time at OCAD U is an opportunity to interrupt and shift these Western institutional values, boundaries, and hierarchies embedded in the arts. I chose to partner with OCAD because decolonization is critical to OCAD University’s forward thinking, I will be able to create great alliances for social change/justice. Centre for Emerging Artists and Designers, Level 3, Rosalie Sharp Pavilion, 115 McCaul St.
Vanessa’s residency will run from January 2019 to mid-June 2019. Her time with OCAD University will open with a welcome lunch and artist talk to take place at the Centre for Emerging Artists and Designers. All are welcome. 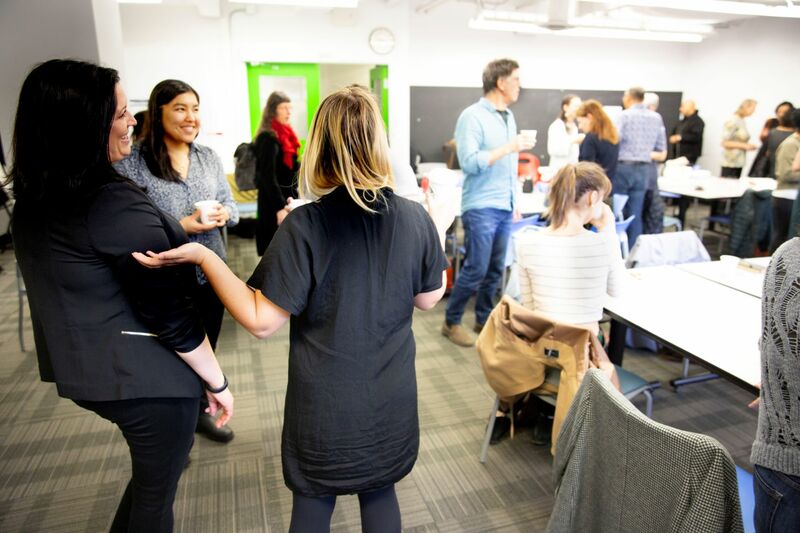 Located on level 3, the Centre for Emerging Artists and Designers (CEAD) is OCADU’s Career Development office and Experiential Learning Program. The CEAD supports the early-career advancement of all OCAD U students and recent alumni. The Rosalie Sharp Pavilion is a wheelchair accessible space. OCAD U’s Ryan Rice, Associate Dean, Faculty of Liberal Arts and Sciences, School of Interdisciplinary Studies, formerly Delaney Chair, along with The Inuit Art Quarterly/Inuit Art Foundation (IAF), hosted a meet-and-greet with partners of the Inuit Futures in Arts Leadership: The Pilimmaksarniq/Pijariuqsarniq Project. The project is a partnered research training initiative (PRTI) that will support Inuit students studying to become academics and cultural leaders working to build capacity for Inuit to work in the arts. INVC/OCAD U and IAF are the Toronto partners in the project. Two Master of Arts Indigenous students from OCAD University ̶ Emma Steen and Adrienne Huard ̶ have been hired as research assistants for the project. Led by a group of Inuit advisers, this project seeks to address the longstanding absence of Inuit leadership across the humanities by establishing a culturally, socially and geographically relevant PRTI to provide meaningful opportunities for education and advancement. Pilimmaksarniq/ Pijariuqsarniq are the Inuit societal values of developing skills and knowledge through "observation, mentoring, practice, and effort." The meet-and-greet included all of the partners working on the research project and upper administration, deans, chairs and Indigenous faculty. The Laxgiik Convocation Robe is an installation created in the style of a Northwest coast Indigenous Chilkat blanket. This project is capturing the spirit in which these prestigious blankets are given: the spirit of reciprocity. Prints will be sold and removed from the installation one by one; the Robe will be ever changing until the last print is sold. Proceeds will be donated to Printmaking, Publications, Sculpture/Installation & Indigenous Visual Culture programs at OCAD U. Location: Indigenous Visual Culture Student Centre, room 410, 113 McCaul. Former OCAD U Chancellor Kiki Delaney and family members gathered in the bright sky-lit painting and drawing studio at 100 McCaul St. on March 27 to meet the recipients of the Delaney Scholarships. The Delaney Entrance Undergraduate Scholarships — renewable, merit-based scholarships for students in Fine Art. 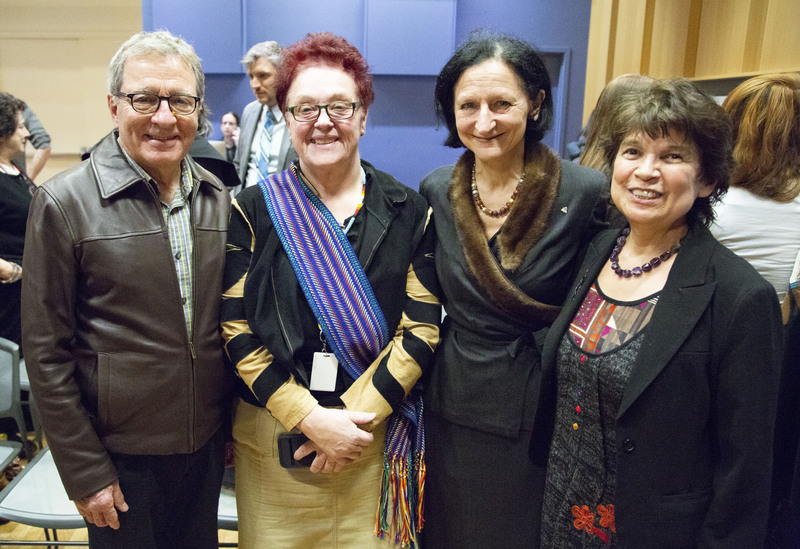 The Delaney Indigenous Visual Culture (INVC) Research Initiatives Fund, which fosters projects and enterprises that support research into Indigenous culture and art. The Delaney Chair in Indigenous Visual Culture. This named Chair allocates funds to critical components of the INVC program, ranging from student outreach and recruitment to the development of teaching resources that incorporate Indigenous perspectives and culture into the curriculum. This year, the scholarships support five incoming students and 13 renewals.